Leaders of the Ukrainian presidential race: Petro Poroshenko (L, photo: Twitter/poroshenko), Yulia Tymoshenko (C, photo: ba.org.ua), Volodymyr Zelenskyi (R, YouTube). Both the latest opinion polls and odds are unanimous about who the three leaders of Ukraine’s presidential race are. However, pollsters and bookmakers differ on who will be number one on election day, 31 March 2019. Former Prime Minister Yulia Tymoshenko led the polls in 2018, but the latest surveys call comedian Volodymyr Zelenskyi the favorite. However, according to the odds, incumbent President Petro Poroshenko is the most likely person to win. If so, he will be the second Ukrainian president to run for a second consecutive term in office. The Central Electoral Commission of Ukraine registered 44 presidential candidates for the election, a record number in Ukrainian history. Thus, this time the voters will receive the longest ever 115-centimeter long ballot. It can be even compared to a computer DDoS attack, when too many simultaneous requests may slow down a web server, making the web sites it hosts inaccessible to visitors. Similarly, a large number of the so-called “technical candidates” can reduce the overall number of the votes cast for the leaders of the race since many people, especially senior citizens, can simply fail to find their candidate on the list. As of now, however, before the final design of the ballots was approved, five minor candidates have withdrawn their registration, shrinking the list to 39 and bringing the ballot to the still-record length of 80 cm. Out of those five, three (MP Dmytro Dobrodomov, Lviv mayor Sadovyi and former journalist Dmytro Hnap) withdrew their candidacy in favor of former Defense Minister Anatoliy Hrytsenko who polls place at 5th-6th position. Opposition MP Yevhen Muraiev endorsed another former member of Yanukovych’s Party of Regions, Oleksandr Vilkul. Another former candidate, Serhiy Kryvonos, declared support to incumbent President Petro Poroshenko. Finally, oligarch Serhii Taruta supported former Prime Minister Yuliya Tymoshenko, however, his name will remain in the ballot since he has withdrawn after the CEC approved the final list. Thus, Taruta’s name will be crossed out of the ballot papers manually by the members of the local electoral commissions. Number of candidates at Ukrainian presidential elections in 1991-2019. 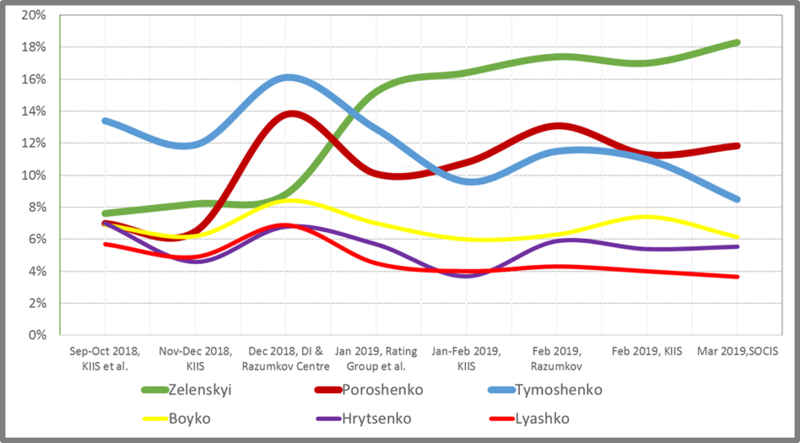 The latest public opinion polls conducted by most respected Ukrainian pollsters – Socis, Rating, KIIS, Razumkov Centre – show that Volodymyr Zelenskyi is the leader of the campaign, while Tymoshenko and Poroshenko are either second or third. Approval ratings of the presidential candidates in September 2018 – March 2019, according to Ukrainian pollsters. 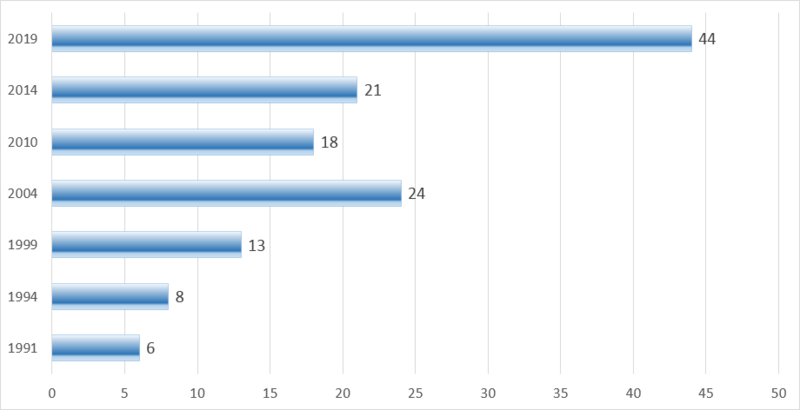 The latest survey by Socis, one of the major Ukrainian pollsters, was conducted on 9-14 March, and here is what it revealed. 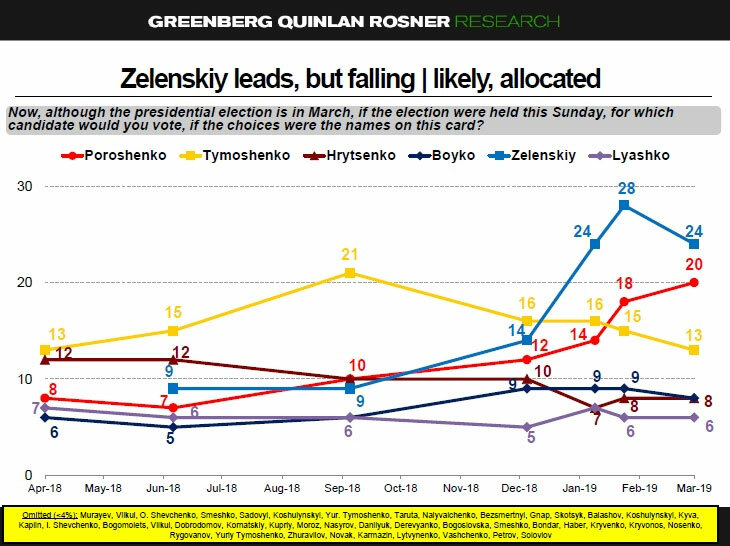 According to the survey by KIIS conducted in late February and early March, Zelenskyi can beat both Poroshenko and Tymoshenko in the second round of the election, and Tymoshenko wins if she goes to the second round with Poroshenko. While pollsters refer to Zelenskyi as leader of the surveys with two-time higher ratings than Poroshenko’s and Tymoshenko’s, two major betting firms give the best odds to Poroshenko to be elected. The odds of other potential presidents range from 100.00 to 500.00 (1%-0.2%) and their chances to win seem highly unlikely according to the bets. Other candidates in the betting range between 35-275 (2.85%-0.36%), according to Parimatch. The parallel odds of the three leaders to not be elected are no surprise – the betting just mirrors the odds of becoming president. Probability to become a president (solid columns) and to not become a president (dashed columns) according to the odds by Favoritsport (blue) and Parimatch (red). So what chances do the three major candidates have to win the election? The only thing for sure now, a week before the elections, is that there are three undisputed leaders, but only the election day will show who of them will become president.